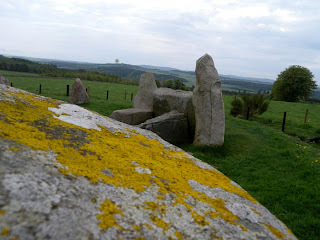 Easter Aquhorthies was the second recumbent stone circle we saw in Scotland. We visited it on our drive from Inverurie to Stirling. Like every other historical monument it was in a field outside of somewhere. “How to Find Easter Aquhorthies Stone Circle, Aberdeenshire, Scotland.... Easter Aquhorthies stands about 18 miles west of Aberdeen and about two miles west of the town of Inverurie. Coming from Aberdeen, it can be reached by a road which goes off to the left from the main A96 opposite the second entrance to Inverurie and Morrison's supermarket.